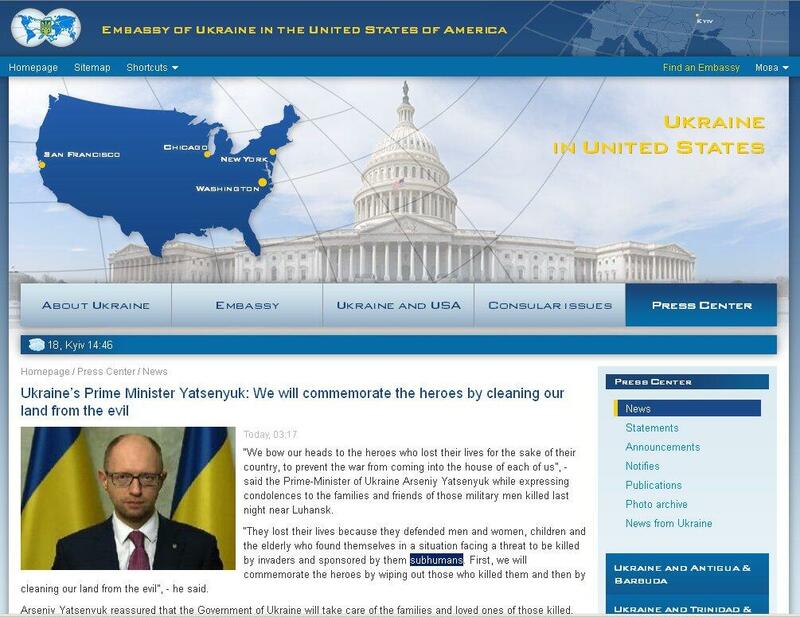 As the world’s media circus moves on to Iraq and the international community’s already-waning attention switches from Ukraine to a new series of the ‘US foreign policy disaster’ horror show, the Prime Minister of Ukraine Yatsenyuk publicly announces the Kiev government’s genocidal plans in relation to anti-government militants as well as the entire civilian population of East Ukraine, largely composed of ethnic Russians, who oppose the Neo-Nazi regime in Kiev. Around the same time, Ukraine’s Minister of Defence announces plans for ‘filtration camps’, where survivors linked to “separatism” will be detained, and Ukraine’s Land Agency reveals that a Ukrainian LEBENSRAUM plan has been defined, which promises free land to Ukrainian soldiers involved in the genocide directed against ethnic Russian Untermensch. 5) KRAMATORSK SHELLINGS – indiscriminate civilian killings by shelling (as above). These are but a few amongst many “successful peaceful measures” taken by the Ukrainian “government”, that have officially claimed the lives of 270 civilians (11.06.14), amongst them a 12 year old boy and 6 year old girl. The death toll is quickly rising. Irrespective of whether you see what’s going on in Ukraine as a civil war, war against a foreign aggressor or anti-terrorist operation, the war crimes of the Ukrainian government (highlighted above in bold) towards East Ukrainian civilians amount to a textbook definition of DEMOCIDE or intentional GENOCIDE, carried out by a government during war times. It hasn’t claimed a large proportion of population yet, as it’s only the beginning, but there’s enough evidence that if it’s not stopped it will lead to a large scale disaster. If you are still in doubt that what is happening is indeed genocide, then please continue reading, as I take you through the eight stages of genocide with concrete evidence for each stage coming from Ukraine and available online. Aside from the criminals, who have ordered and carried out the crimes, there are also individuals and media outlets that have either ignored, facilitated, encouraged, promoted or applauded one or all of the stages of this genocide. I believe that these Cheerleaders are also to blame, though not as much as the perpetrators. Stage 1. CLASSIFICATION – people are divided into ‘us’ vs ‘them’. a) Ukrainians vs Russians: Extreme Ukrainian Nationalism celebrated on Maidan is the root from which hate and genocidal intentions towards Russians and Ukrainian Russians grew. Obscuring the darker undertones of what is going on, Ukrainians would play a game where everyone would be encouraged to jump to show that they are not Russians: “Hto ne skache, tot moskal” (Who is not jumping is Moskal- a derogatory term for ‘Russian’), later re-enacted in subways and school gatherings. Genocidal intentions were revealed from early on, especially by more extreme groups like Praviy Sector: “Moskali na nozhi!” (Knife the Russians! ), but also by nationalist youth: “Hang Russians!” . ANNE APPLEBAUM (ex-editor of the Economist and member of the editorial board of The Washington Post) with her article Nationalism is exactly what Ukraine needs in which she denigrates industrial East and praises ‘nationalistic patriots’, who are waging war against it, as the only hope for Ukraine’s future. EUROMAIDAN PR: Refugees from Donetsk are rude, machinators and lovers of free passes. At a later stage, many people will be justifying genocide as either fight against evil Russians or extermination of ‘bidlo’ or struggle against Soviet mentality. All these are mechanisms of denial of the crime. East Ukrainians, who rose up against Russophobe post-coup government, were termed ‘separatists’ and once they started taking over governmental buildings (just like Maidaners did), they were re-termed ‘terrorists‘. Most common symbol used is an orange-and-black striped Colorado beetle (left), because it resembles the colors of the St. George ribbon (right) worn by Pro-Russians. Stage 3. DEHUMANIZATION – one group denies the humanity of the other group. CHANNEL 5 (owned by Poroshenko): ran insecticide ad (covert call for genocide/subliminal message that killing ‘Colorados’ would lead to prosperity of the country) which encourages to kill Colorado Beetles by fumigating them from a canister bearing black and red colours of Praviy Sector’s flag. RADIO FREE EUROPE/RADIO LIBERTY: What’s orange and black and bugging Ukraine? Stage 7. EXTERMINATION – it’s extermination to the killers, because they do not believe their victims to be fully human: Odessa Massacre, Luganks bombing, Mariupol killings, Slavyansk shelling. Calling it anti-terrorist operation or fight against Russian invasion is a way of denying that Ukrainian Army is carrying out genocidal orders. More specific denials are Odessa victims burnt themselves or Lugansk victims bombed themselves. History was written by the winners before the invention of the internet. Now, despite the Ukrainian army trying to prevent media from working, many journalists are revealing the blatant lies of the Ukrainian government and Ukrainian/Western media with regards to the ‘Russian invasion’, such as Mark Franchetti’s observation that most people fighting against Kiev government in the East are civilians of Donbas, and not mercenaries from Russia, bandits, alcoholics or drug addicts. This is the impression I got from watching numerous Youtube videos from the battlefields. The truth will eventually emerge and Ukrainians and anyone, who supports them, will not be able to write their history without contradictory comments on the margins. There are enough people out there, who aware of what’s going on, and someone will write the Perpetrators and Cheerleaders into History as the Criminals that they are. Just as Byron went to fight against Turks in the Greek War of Independence, there are Russian citizens, who have decided to come to East Ukraine and fight against Ukrainian Army. There is a high chance that some money is coming from Russia to support them. There is also a high chance that the whole ‘Ukrainian civil war’ is just a fight between Ukrainian aristocracies or global elites, or it’s a war for shale gas (http://bit.ly/1lCylAK) or war organised by global financial elites. However, and most importantly, there is a large percentage of people in East Ukraine, who have chosen to come and vote in a referendum, if not for separation from Ukraine, then at least for federalisation. These largely working-class people (richer people do not want to risk their wealth by standing up against Kiev’s government) could not accept the historical narrative offered by Euromaidan, including Bandera, anti-Russian sentiments, heavenly hundreds, denial of second world war victories, etc. These anti-government people should have been listened to, talked to and negotiated with, not totally ignored and eventually bombed and shelled. Genocide is a total abomination of our species that should be condemned by anyone with any conscience, as soon as one becomes aware of it. I consider Cheerleaders, who have supported, encouraged or applauded any or all of the stages of the Genocide that is now going on in Ukraine, as much an abomination as the crime they cheer for. With the help from its powerful war-mongering allies, Ukraine might build a powerful and rich nation (unlikely), cleansed out from ‘evil’ Russians, but they will never regain what they have irreversibly lost – their HUMANITY. As a half-Ukrainian half-Russian, who grew up in Donbas, the centre of ‘Colorados’ and ‘subhumans’, I’m deeply hurt by those other Ukrainians, who harboured so much hate towards Donbas in their hearts, saddened to see my country take a genocidal path and extremely worried about the fate of all my fellow Donbas citizens, who are or soon will be under a significant threat of being killed. I urge all Ukrainians, who are reading this and have not lost all their humanity yet, to put pressure on their local and Kiev government to stop ‘anti-terrorist operation’ before East Ukraine is drowned in blood. P.S. If you are aware of any Cheerleaders that I haven’t included, please include them in the comments or send me an email. Thank you.